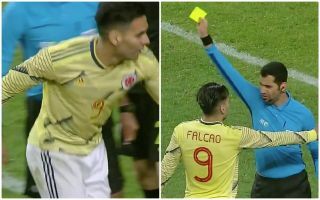 Colombia stalwart Radamel Falcao was left furious during the latter stages of his side’s friendly clash with South Korea on Tuesday. As seen in the video below, Colombia were trailing 2-1 in the final few minutes of their encounter, with the medical team called on to attend to one of their players. Having left some of their medical kit behind on the pitch, Falcao thought he would take matters into his own hands to hurry them along and decided to hurl what looks to be a cooler of some sort off the pitch and behind the goal. Unfortunately for him, it only served to earn him a yellow card from the referee who wasn’t impressed and slowed the game down even more, as his over-eagerness and desire to get a result in the friendly contest seemingly went too far. Nevertheless, his commitment has to be praised to an extent too even though it wasn’t a competitive encounter, albeit he could have perhaps channeled it in a more effective way instead of picking up a needless booking.